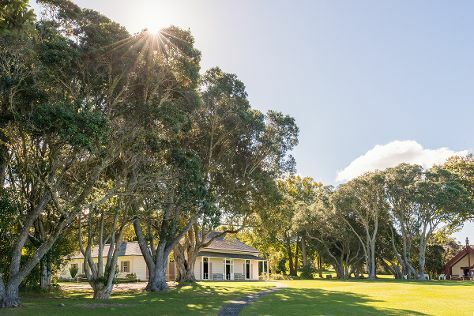 Your inner history buff will appreciate Waitangi Treaty Grounds and The Stone Store & Kemp House - Kerikeri Mission Station. Step out of the city life by going to Paihia Harbour and Parasailing & Paragliding. Step out of Paihia to go to Russell and see Pompallier Mission and Printery, which is approximately 44 minutes away. There's still lots to do: get close to the beloved marine mammals with a swim-with-the-dolphins experience, learn about winemaking at Byrne Northland Wines, trek along Tapeka Point Track, and discover the deep blue sea with a scuba or snorkeling tour. To see photos, ratings, more things to do, and other tourist information, read Paihia trip planner . Denver, USA to Paihia is an approximately 21.5-hour combination of flight and taxi. You can also do a combination of flight and bus. Due to the time zone difference, you'll lose 19 hours traveling from Denver to Paihia. Wrap up your sightseeing by early afternoon on the 19th (Thu) to allow time for travel to Rotorua. Take a break from the city and head to Wai-O-Tapu Thermal Wonderland and Huka Falls tracks. Spend the 21st (Sat) immersed in therapeutic waters at a local thermal spa. There's lots more to do: identify plant and animal life at Rainbow Springs Nature Park, delve into the lush surroundings at Redwoods, Whakarewarewa Forest, take in the natural beauty of Te Puia, and contemplate the geological forces at Waimangu Volcanic Valley. To see more things to do, reviews, traveler tips, and other tourist information, use the Rotorua trip itinerary planning site . You can do a combination of taxi and flight from Paihia to Rotorua in 4.5 hours. Other options are to do a combination of taxi, flight, and bus; or drive. In December in Rotorua, expect temperatures between 71°F during the day and 59°F at night. On the 23rd (Mon), wrap the sightseeing up by early afternoon so you can travel to Queenstown. Kick off your visit on the 24th (Tue): look for all kinds of wild species at Kiwi Birdlife Park, zoom along the surf with a waterskiing or jet-skiing adventure, and then race across the water with a speed boat tour. Get ready for a full day of sightseeing on the next day: pause for some serene contemplation at St Peter's Anglican Church, get the adrenaline pumping with an extreme tour, then soothe aching muscles at some of the top local wellness centers, and finally do a tasting at Peregrine Wines. Make your Queenstown itinerary with Inspirock to find out what to see and where to go. Traveling by flight from Rotorua to Queenstown takes 5.5 hours. Alternatively, you can do a combination of bus and flight. Finish up your sightseeing early on the 25th (Wed) so you can travel back home.